Enjoy Geraldo Rivera's free-to-view collection of exclusive content spanning decades of American culture, international conflicts, and much, much more.Click here to see all shows. This Fox News Special 1000 Miles Of Bad Road aired with Geraldo in 2004. During these recent years after Saddam was ousted, Iraq was still swarming with coalition troops and activity. Geraldo takes us through the situation there, talking with enlisted men and Iraqi officials. Watch here. Geraldo's anniversary special celebrating forty years in the news business, 2010. Watch Here. In what is still one of the highest-rated specials of all time, Geraldo gets access to investigate and begin demolition in order to open the vault of Al Capone, notorious Chicago gangster. Earning the title "most-watched syndicated special", 44 million people tuned in to watch. Watch here. Geraldo has guests Roy Innis and John Metzger on set for the show, when a question from the audience ignites the anger of one of the skinheads during an already tense back and forth. The audience and entire set soon erupt into a fight, live on air, before the skinheads are removed. 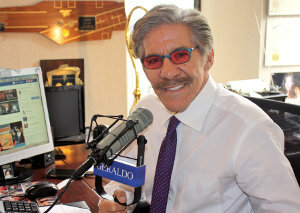 Geraldo, despite a broken nose, continues the show. Watch Here.